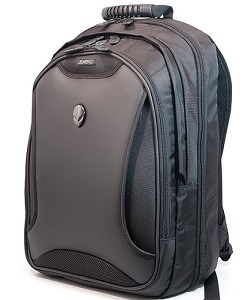 The Alienware Orion M17x Backpack keeps your gear secure and protected on the go. The über cool design and heavily-padded back panels are ideal, while the subdivided main compartment easily holds up to a large 17.3" laptop. A secondary compartment contains 10 interior pockets to hold anything from pens to memory sticks to plane tickets to MP3 players. Fits widescreen laptops up to 17.3"
Fits Devices Up To: 17.3"
Product Dimensions: 15.5" x 7" x 20"
Laptop Compartment: 12" x 2" x 18"